CALGARY, ALBERTA--(Marketwire - Feb. 19, 2013) - Teras Resources Inc. ("Teras" or the "Company") (TSX VENTURE:TRA)(OTCQX:TRARF): Teras is very pleased to report results from its recent geochemical sampling program at the Cahuilla project in Imperial County, California. A total of 130 samples were collected in the northeast section of the project area considerable distances from known precious metal mineralization resulting in the substantial expansion of the favorable epithermal system. 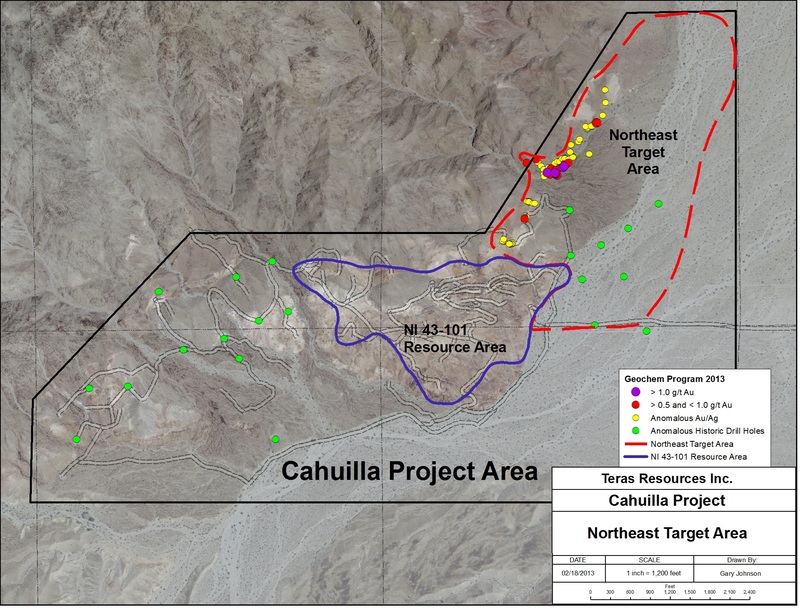 Consequently, the Company has significantly increased the exploration potential of Cahuilla in the northeast portion of the project area. The plan map below illustrates the anomalous sample locations in the northeast project area and their proximity to the defined NI 43-101 precious metal resource. Surface geochemical samples were collected along the far northeast exposure of the Modoc Fault which eventually extends under shallow pediment cover more than one kilometer northeast of the known resource boundary. Samples were collected in strongly silicified sediments, intrusive and volcanic breccia outcrops before becoming covered by the shallow surface gravels. To view the figure associated with this press release, please visit the following link: http://media3.marketwire.com/docs/854120.jpg. All 130 surface geochemical samples collected (yellow) were anomalous in precious metal mineralization, while the sample locations indicated in purple assayed greater than 1.0 g/t gold and those shown in red ran between 0.5 and 1.0 g/t gold. Surface gold and silver values as high as 1.85 g/t and 37.1 g/t respectively were encountered. Historic exploration holes (green) drilled in the northeast pediment that host anomalous precious metal mineralization are also illustrated. Values of up to 3.40 g/t gold and 95.0 g/t silver were detected in these historic drill holes within strongly silicified rocks beneath the shallow gravel cover. Peter Leger, President and CEO of Teras Resources commented, "We are very pleased with the new assays results from the recent geochemical sampling program. All samples collected from the northeast extension of the Modoc Fault contained anomalous precious metal mineralization while many indicated impressive gold/silver grades which significantly extend drill targets for more than one kilometer from our current NI 43-101 resource. We look forward to conducting additional field work in the near future to further increase the size of our already extensive precious metal system." Dale A Vitone P. Eng., registered with the Association of Professional Engineers of Ontario, Alberta and North West Territories and a Director for Teras, is the Company's nominated qualified person responsible for monitoring the supervision and quality control of the programs completed on the Company's properties. Mr. Vitone has reviewed and verified the technical information contained in this news release. The Company is focused on developing its Cahuilla project located in Imperial County, California. The project encompasses an area of at least 3 km by 1.5 km and demonstrates the potential for a large-scale, bulk mining operation consisting of altered and mineralized sedimentary and volcanic host rocks with numerous sheeted high-grade quartz veins. Teras filed a NI 43-101 compliant technical report with an indicated resource of 1.2 million plus ounces of gold and 11 million plus ounces of silver on its Cahuilla project (70.148 million tons at an average grade of 0.015 ounces per ton gold and 0.17 ounces per ton silver with a cutoff of 0.008 ounces per ton gold). The Company has an aggressive plan to increase the resource and develop the project for future mining operations. This press release may contain "forward-looking information" within the meaning of applicable Canadian securities legislation. All statements, other than statements of historical fact, included herein may be forward-looking information. Generally, forward-looking information may be identified by the use of forward-looking terminology such as "plans", " expects" or "does not expect", "proposed", "is expected", "budgets", "scheduled", "estimates", "forecasts", "intends", "anticipates" or "does not anticipate", or "believes", or variations of such words and phrases, or by the use of words or phrases which state that certain actions, events or results may, could, would, or might occur or be achieved. In particular, this press release contains forward-looking information regarding: the potential of the Cahuilla Project; the potential of geophysical programs on the Cahuilla Project; the potential to expand the resource, to identify new targets and to identify high grade zones and structures; the timing of and potential of drilling and exploration programs, surveys, studies and developments; and the potential for finding high grade deposits. This forward-looking information reflects the Company's current beliefs and is based on information currently available to the Company and on assumptions the Company believes are reasonable. These assumptions include, but are not limited to, the actual results of exploration projects being equivalent to or better than estimated results in technical reports or prior exploration results; future costs and expenses being based on historical costs and expenses, adjusted for inflation; continued success in drilling and exploration programs and geological and geophysical studies at the Cahuilla project; successful studies in mining techniques and metallurgy; commodity prices continuing at today's prices or rising; obtaining the necessary funding to carry out recommended work programs, exploration and studies; and continued success in obtaining permits. Additional assumptions can be found in the Company's disclosure documents on the SEDAR website. Forward-looking information is subject to known and unknown risks, uncertainties and other factors that may cause the actual results, level of activity, performance or achievements of the Company to be materially different from those expressed or implied by such forward-looking information. Such risks and other factors may include, but are not limited to: the early stage development of the Company and its projects; general business, economic, competitive, political and social uncertainties; commodity prices; the actual results of current exploration and development or operational activities; competition; changes in project parameters as plans continue to be refined; accidents and other risks inherent in the mining industry; lack of insurance; delay or failure to receive board or regulatory approvals; changes in legislation, including environmental legislation, affecting the Company; timing and availability of external financing on acceptable terms; conclusions of economic evaluations; and lack of qualified, skilled labour or loss of key individuals. Although the Company has attempted to identify important factors that could cause actual results to differ materially from those contained in forward-looking information, there may be other factors that cause results not to be as anticipated, estimated or intended. Accordingly, readers should not place undue reliance on forward-looking information. The Company does not undertake to update any forward-looking information, except in accordance with applicable securities laws.